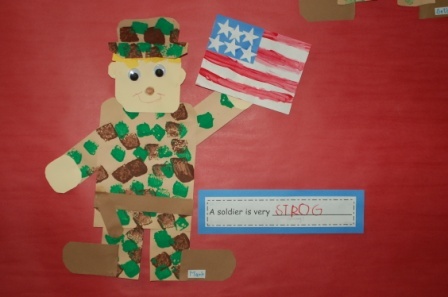 This entry was posted in American Hist./Patriotic, Art/Crafts, Bulletin Boards/Walls, Holidays/Seasons and tagged Art/Crafts, Children, Education, Elementary School, Homeschool, Kids, paint, soldier, Teacher Resources, Teachers, Teaching, Veteran's Day by Squarehead Teachers. Bookmark the permalink. Cute idea. For those of us who sometimes don’t like the mess of a painting project, tissue paper in green and brown would probably look pretty cool on this project. So true. There are so many positives in this little project!